In the hamlet of Villanova (3,8 kilometres far from Castenaso), the centre has eight tennis courts, five of which in red clay (two of them covered all year round) and the others in synthetic grass. Also paddle and beach tennis classes are available. You can participate to courses or private lessons. 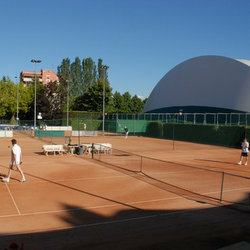 During summer time a swimming pool is open in a large green area equipped with a beach tennis field and a bar. The gym organizes courses of cardio fitness, postural pilates, total body and gag. The restaurant has 40 seats inside and tables outside.